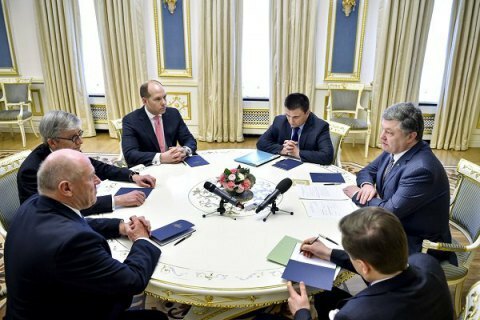 The president and the Ukrainian World Congress discussed the coming Dutch referendum on the EU-Ukraine association agreement. President Petro Poroshenko has met a delegation of the Ukrainian World Congress (UWC) headed by its president Eugene Czolij. According to Poroshenko's website, he emphasized the top priority of liberating pilot and MP Nadiya Savchenko and all Ukrainians prisoners of war from Russian prisons. He drew attention to continuous human rights violations in occupied Crimea and a large-scale militarization of the region. In this context, the president enlisted the support of the UWC in the establishment of the international mechanism for de-occupation of Crimea in Geneva Plus format. The parties also discussed popularization of Ukraine's position ahead of the Dutch referendum on the EU-Ukraine association agreement. Poroshenko invited UWC representatives to take part in celebrations on the occasion of the 25th anniversary of Ukraine's independence and join the commemoration of the Babyn Yar victims on the 75th anniversary of the tragedy. As reported earlier, the president said that Ukraine was coordinating the drafting of the so-called "Savchenko list" of sanctions with the USA and the EU.